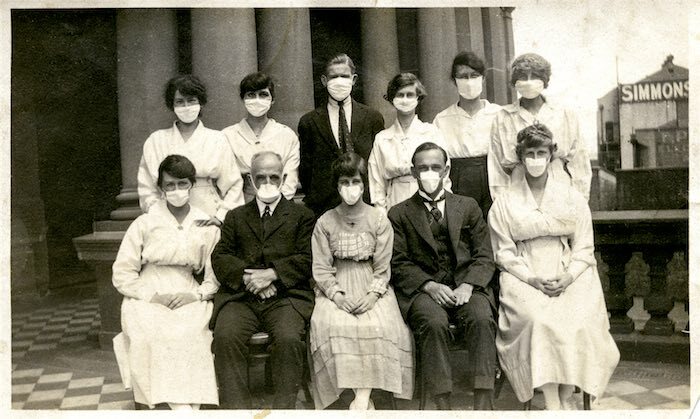 In the lead up to our joint lecture with the City of Sydney, Flu Frenzy: Taming the 1919 Influenza Pandemic, RAHS Councillor Dr Peter Hobbins recently wrote an article in The Conversation, ‘100 years later, why don’t we commemorate the victims and heroes of “Spanish flu”’? Peter’s article reminds us of the devastating impact the “Spanish flu” had in Australia. Despite only lasting for just over a year, the influenza was responsible for the death of 50-100 million people worldwide. In Australian alone, there were 15,000 casualties, which closely matches the numbers of those who served in the AIF during the Great War. When the ‘Spanish’ flu hit Sydney in January 1919 it was another blow for a war-weary community. How did Sydney cope in 1919 when influenza infected a third of the city’s residents? How did the community rise to the challenge? What were their stories of suffering, sacrifice, solidarity and scandal? Explore how local, family and medical records can help us piece together the intimate impact of this deadly global disease. Local historians share their insights into the emergency response and how we remember this devastating pandemic. Laila Ellmoos is a historian with the City of Sydney’s history team Laila is the author of three books including Our Island Home: a history of Peat Island published in 2010. She is a member of the Professional Historians Association of NSW & ACT. Dr Peter Hobbins is a historian of science, technology and medicine at the University of Sydney. His research in Australian history has spanned snakebite, quarantine and aircraft accidents. As a Councillor of the Royal Australian Historical Society, Peter is leading a project to encourage community historians to research and commemorate the local impact of the 1919 pneumonic influenza pandemic. Chrys Meader is a qualified librarian and historian. She has co-authored two books on Marrickville and written a number of articles for journals, as well as conducting lectures and history walks. Chrys also wrote suburb entries for the online Dictionary of Sydney. In 2001 she received from the Federal Government a Centenary of Federation medal for services to local history, particularly her work with school children. Dr Lisa Murray is the City Historian, author and content producer specialising in urban and public history. She is a member of the Professional Historians Association of NSW & ACT.